Buying plane tickets is a serious bit of voodoo. Prices are constantly fluctuating as though conducted by supernatural forces humans lack the capacity to comprehend. 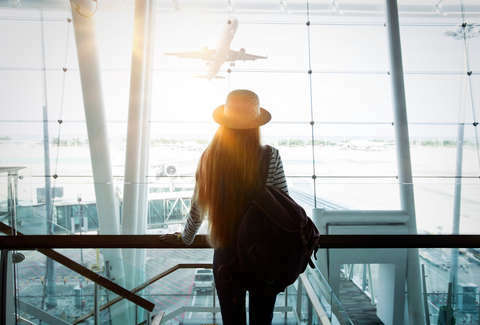 A new study from CheapAir.com released Thursday attempts to demystify a little of the mystery to make traveling less of a headache. It sifted through 917 million airfares in more than 8,000 markets to hone in on the best times to buy tickets. The study -- its fifth annual addition -- found that fares change an average of 61 times (61 times!) after becoming available. That's basically in line with last year's finding of 62. The site also discovered that the cheapest ticket for an average flight is available 76 days out from the trip. This side of finding a surprise flash sale, booking at the last minute is not to your advantage. "Five years ago, we started crunching airfares because so many travelers felt like the market was volatile and random," Jeff Klee, CEO of CheapAir.com, said in a statement. "Today, we’re seeing that there are stable patterns. If you know the basics, you can almost always buy within a few percentage points of the lowest price." Increasingly over the five years CheapAir.com has conducted the study, it found that buying early leads to significant savings. Over the first three years, the average "best day" was 54 days from departure. That figure climbed to 70 days in 2018 and is now up to 76. The study also found that the day of the week on which you purchase does not significantly impact the price of fares. The day of the week you're flying, as frequent travelers can attest, does make a difference. Tuesday and Wednesday are the cheapest travel days, with Tuesdays saving an average of $79 over Sundays, the most expensive travel day. 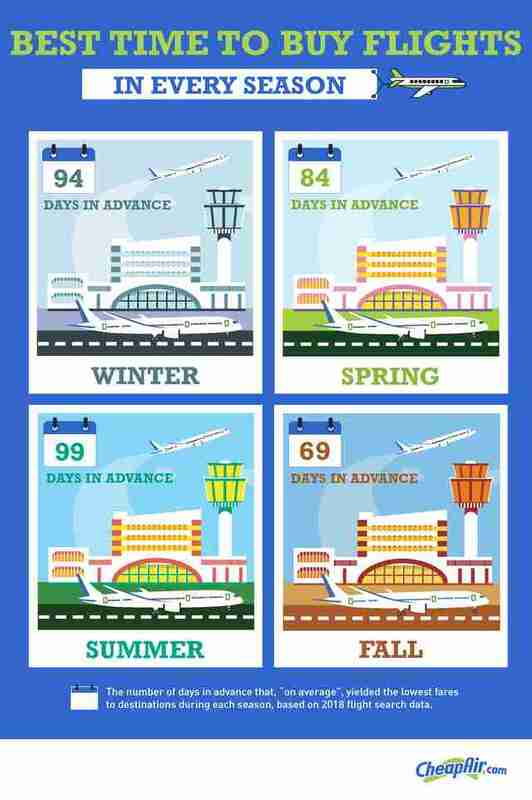 Additionally, CheapAir.com created the graphics shown here to visualize the six, as they call them, "booking zones" for prices over the lifespan of a given ticket. Those insights include buying 203 to 315 days in advance of a trip can cost an extra $50 on average. You, of course, gain assurance that you're getting the flight you want as well as premium seat selection. Purchasing at the last minute can cost up to $220 more on average. If you like that assurance on dates and seats, you're in good shape purchasing 202 to 116 days out as well, when it only costs an average of $20 more than at the study's proposed best time to purchase. 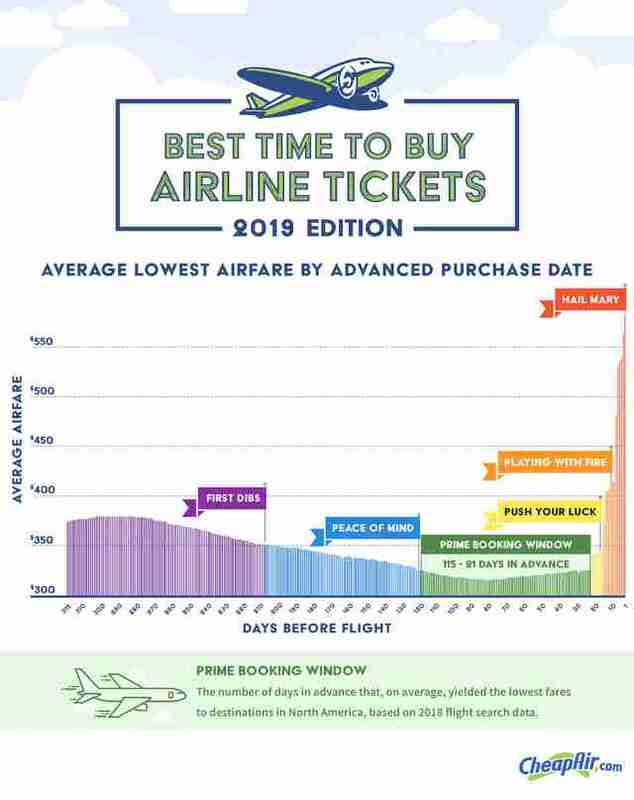 CheapAir.com also broke down the best time to buy according to the season, as there are some significant shifts by season in their findings. Those findings can be seen in the graphic above. It's useful knowledge for any traveler. Though, it's also worth taking with a grain of salt. Some airlines -- JetBlue and Frontier among them -- frequently offer last-minute sales. It's near impossible to predict when they're coming, and you'd have to be fortunate enough to have your desired route in the sale, but it's one instance in which cheap fares can arrive late. Moreover, there's undoubtedly some fluctuation based on airline. But that unpredictability all part of the fun of buying tickets, right? Right?